This console was refurbished by us a little over 2 years ago. The electronics were refurbished by Cadac Specialist engineer Gwyn Mathias - and the Cosmetics were refurbished by Bob Muir. It will be serviced by Gwyn Mathias prior to delivery. This super console was manufactured in the mid 80's and was originally designed for Theatre use. One of the good things that have come out of digital recording is the ability of being able to use high quality live consoles with DAW systems like Pro Tools. As far as live, or studio, consoles are concerned none come better than Cadac. 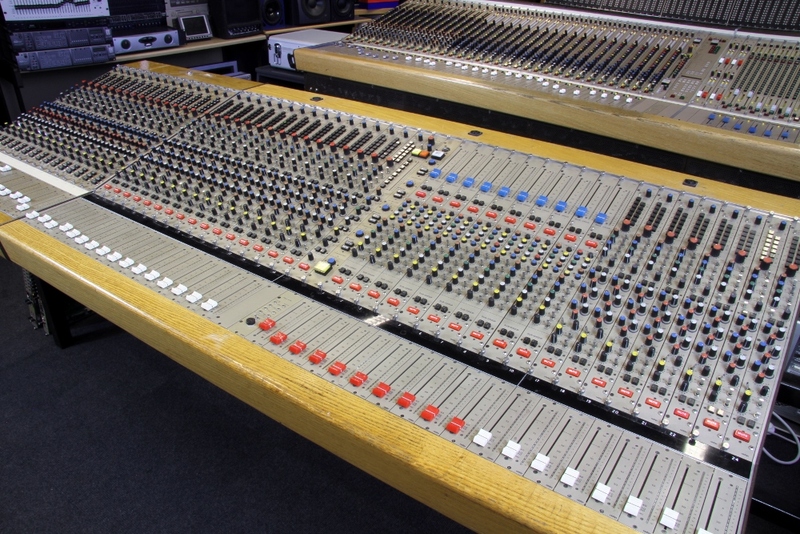 Many owners of 70’s & 80’s Cadac consoles would place them is the same league as Neve consoles of the same era, they are extremely well made and provide very high quality audio. Click here to meet a few Cadac fans. CADAC consoles provide an extremely high level of audio performance. The A Series input module provides balanced Mic & Line input with a transformer on the output, the channel has a 3 band fully parametric EQ with a switchable, variable frequency High Pass Filter 40Hz- 120 Hz. There are also 6 aux sends, each send can be switched to either Pre-Post or off. The routing is unusual in that there are 8 group switches routing the channel signal to the selected sub group there is also other sends from the channel which can send the pre or post signal to groups 9 and or 10. Other input channel facilities include a Switched Insert, Phase reverse, 48v Phantom switch and a 15db pad. Mute, pfl & in-place solo monitoring. The 10 group modules have 6 aux sends plus a switched insert and solo switches there is also a matrix which can be used for the control room monitoring in or as a group matrix in a live situation. The group outputs are transformer balanced using mainly Marinair transformers. All transformers were manufactured by Marinair or Lundahl. Cadac consoles are manufactured to a very high standard using some military spec plus high tech connectors, CADAC A Series consoles can be linked together when more channels are required in a live situation for instance. The power supplies on this desk can power up to 56 modules. The modules are constructed in a modular way which assists in servicing the modules. The 39 modules console is made up using a main 24 channel desk with a 15 channel sidecar which can route to the 10 groups on the main desk and to the 6 aux masters, we may split of required. If purchased separately the sidecar will be provided with a power supply. The prices of Helios consoles have gone through the roof recently, particularly in the USA, at the moment the Americans have not yet discovered CADAC consoles when they do the prices of these great consoles may also follow those of the Helios - another great UK recording console. QUOTE by Mateo, Dubrovnik, Croatia.